Die folgende Beschreibung ist eine automatische Uebersetzung von J-Hoppers Osaka Guesthouse ist ein freundliches Hostel befindet sich in der Nähe von Umeda Sky Building, mit "vielen Bars / izakaya / Restaurants in der Nähe", so unsere Gäste. Dieses saubere Herberge verfügt über WLAN im gesamten Gebäude sowie eine Klimaanlage, eine Waschmaschine und eine Dachterrasse. Es gibt Privatsphäre Vorhänge und Leseleuchten für jeden bequemen Bett. Hostelworld Reisende haben gesagt, diese Herberge ist den Preis wert, vor allem ihre häufigen nächtlichen Aktivitäten und Touren. Why choose J-Hoppers? Because you can enjoy international exchange with Japanese people. Plus, we have tons of free services, with Wi-Fi throughout the hostel, a shared PC, motorcycle and bicycle parking and more. Our TV lounge has a DVD player and TV. The rooftop terrace is the perfect place to chill out with your fellow travelers. Our 24hr bathrooms include soap and shampoo. There is a hi-tech toilet and lavatory with hair dryers on each floor. We provide FREE toast and soup every morning from 8:30-10:30am at the kitchen! We have a communal kitchen which is fitted with a microwave, toaster, coffee maker, rice cooker, cooking utensils, tableware etc. Free coffee, tea, Japanese tea and various kinds of seasoning are available to use. Our facilities include a beer vending machine, photocopy and print service, local and international phone calls and a fax service. We can also give you free detailed maps of Osaka, the bus routes and tons more info. We’re happy to store your luggage for free before check-in and after check-out. Longer-term luggage storage is available for returning guests. Please note that our building is a five-story building with NO ELEVATOR. We have ANOTHER BRANCH "J-Hoppers Osaka Universal" in Osaka. Please DO NOT make a mistake. We are close to JR Fukushima station. We can not provide the rooms to guests with children less than 3 years of age as they may disturb guests at night. even if they stay with their parents in the same room (They can only stay in private rooms with their parents). -Bike for ¥700 per day (¥200/hr within five hours). Tuesdays we have takoyaki party! You can experience making takoyaki which is Osaka local food at a takoyaki shop nearby. Starts at 7pm. (food and drink are not included). Fridays we have International Exchange Party! Our hostel becomes a bar as we host our International Exchange Party...even non-guests can join this party so you can enjoy cross-cultural communication! Starts at 7pm. Your first drink is free and all draft beers and cocktails are served for only ¥300! 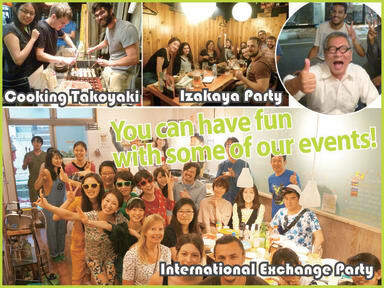 Sundays we have an Izakaya (Japanese-style bar) party! Mr Yano will take guests to an Izakaya so you can learn the Japanese way to drink! It starts at 7pm (food and drink are not included). This even is the most popular event in J hoppers! You must love drinking with the party animal Mr Yano! All of our staff speak English and are happy to have a friendly chat with you. We also try to be up to date on what is happening in the area and can give you advice where to go. Our great location means it takes less than an hour to get to the main tourist sights in the Kansai area such as Kyoto, Nara, Kobe, and Himeji, all accessible by train. So we can be your home base for exploring all of Kansai. There are lots of Izakaya (Japanese-style bar) and bars with many kinds of local foods, a post office, a supermarket, a Seven Eleven with international ATM, public baths (sento), etc, all less than five minutes’ walk from here. We can also provide the information for the Hiroshima , Kyoto and Takayama as well since we’re a part of the J-Hoppers chain. The Hostel is very cool and nice. The staff is very friendly and helpful. The rooms are very clean and good furnished. The breakfast was good. My fourth stay at this Hostel, great time again! Very nice staff. Great location. Nice activities provided. The hostel offers everything you need. Sure it's not a super modern place to stay like some other hostels. But the staff is really nice and they also organize some events. (Not really common in Japan) Mr. Yano-San is unique and a great guy. I only spent one night at the hostel, but would recommend this place. 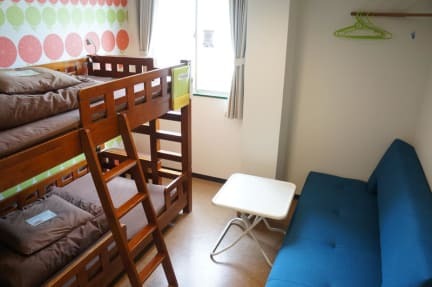 It is well connected to the airport and major train stations, everything was clean and the staff really friendly. Had a great stay in an interesting neighborhood. The few meters to the next train station made it perfect. The staff helped us out and we got to know a lot of cool and interesting people there! Cosy small hostel. Very small bed rooms, with a small safe. Showers and restrooms were clean. Common area was small, but good and cosy. Die folgende Beschreibung ist eine automatische Uebersetzung von Ich denke, was uns besonders macht ist unsere Veranstaltungen, bei denen wir unsere Gäste die lokale Lebensart zu erleben. Zum Beispiel am Freitag haben wir einen internationalen Austausch Party, wo man unter die Einheimischen mischen und unterhalten können. Mittwoch und Sonntag nehmen wir alle zu einem Izakaya, einem japanischen Stil Bar, wo die Gäste die japanische Art zu trinken zu lernen. Es gibt auch Wanderungen zu Orten abseits der Touristenpfade. Wir sind ca. 15-20 Minuten zu Fuß von der Kita-Bereich, der einer der Hauptteile der Innenstadt von Osaka ist. Ich empfehle auch Ausflüge in unserer Straße, es ist eine ruhige Einkaufsstraße mit vielen Restaurants und Bars.